Game on Grafix aka "Mame Marquee"
Shopping on the Game on Grafix website was a breeze everything is in category's and easy to find, most all of the products have good clear pictures to represent the product. Though some picture could do to be abit larger, overall i was thoroughly impressed. Placing my order was simple and straight to the point no convoluted basket's or trying to up sale, just a simple checkout interface that lets you choose your shipping option and spend your money. First i want to say that i thoroughly read all the product/ordering/shipping information proved to me I always do when I am about to spend a large amount of money. I understood that it would take 7-10 day's to print the product and have it shipped. I placed my order on the 6th a Friday, I understood that no work would begin until the 10th because of the weekend that's fine and understandable. I had heard nothing from them for 2 full weeks until i contacted them on the 20th also a Friday, inquiring as to the progress of my order, I was informed that there was a defect in on of the items I ordered and that it had to be reprinted, Ok i understand that fine HOWEVER since that was the case it should have been communicated to me that there would be a delay. They promptly shipped my order on the 20th, and it was delivered on the 25th. Packaging was simple and to the point, it was packed in a HEAVY cardboard tube, to insure no damage to the product. I thoroughly inspected each piece that i received 6 pieces in total. Absolute perfection great product sturdy and beautiful printing I had to trim it unfortunately due to my own bad calculation's. Again absolute perfection same great quality and great printing through i would have preferred it printed on the heaver duty paper used for CP overlay's and CP side art. Once again the same GREAT printing and quality is there, rugged nothing is gonna scratch this stuff. However this is where things started to go down hill, the artwork was not 100% reproduction it is not proper left and right artwork it a mirror image, in other words. Instead of reading the name of the manufacture from back to front on both side's, one side is read back to front and the other side read's front to back. So very disappointing. "edit 06/07/11 After having talked with Scott at GoG I did in-fact receive the right art and I'm and ID10T"
This is where it get's really bad. I have absolutely no complaints about the craftsmanship, the artwork is a QUALITY reproduction it's as beautiful as i remember in the arcades. HOWEVER again it is not proper left and right artwork it is mirror image, on the 2P side of the cabinet the artwork is ASTONISHINGLY perfect correct size, went on easily just perfect. On the 1P side though the text for the artwork is backwards, it looks horrible and i have had to move my cabinet with the 1p side to a wall to hide it. And to make matter's worse whoever cut the sheet from the printer used a dull knife and left a jagged edge at the bottom which caused the adhesive protection sheet to split causing application to be a nightmare after working on it for over 2hrs I finally got it on with no bubble's or wrinkle's. "edit 06/07/11 I got in touch with Scott from GoG and sent him picture's of the bad side he apologized profusely and sent me out replacement side art the next day priority mail 2 day shipping"
After contacting Game on Grafix about the shipping issue's they prompted got in touch with me and told me what was going on and that my product would be shipped immediately, they even refunded me $7.68 for the trouble. Re: Game on Grafix review aka "mamemarquee"
Scott has been great over the years and supplied many quality pieces to the community. We've been using their services even here in the UK as their quality is far superior to that of other printers we've worked with in the UK. It is worth noting on your points that the service has dropped off slightly but Scott has explained on the website that it is a small operation and as he has had many family commitments, a change of priority was in order and his focus has been elsewhere for the last few months. This is unfortunate but I can sympathise with that as our business works in much the same way and so may suffer if I am not 100% able to focus on it. It may therefore explain why some of the finishing is not 100% spot on and hopefully Scott will pick things up in time. I understand that, I'm not really angry about the customer service/shipping or anything like that, the thing i found most disappointing and something that really just chaps my is the mirror image artwork, i genuinely feel cheated with the amount of money that the artwork cost me it should be proper left right artwork. I want to reiterate that I would still recommend Game on Grafix to friends and family member's, however after my experience i would tell them it's almost required to inquire about the artwork first and make sure it's the proper artwork before purchasing. I agree with the mirror image comment. I recently created a 'Dark Knight' artwork set for one of our cabinets and the side-artwork was of the joker holding a playing card; I had to photoshop the text on the card to be the correct way round on the other side. Out of curiosity, what artwork was it you had? got any shots of the two sides? That is terrible, have you been issued with free replacements or a refund? I thought that place was the #1 choice for printed graphics.. I still want to make it clear that the craftsmanship is just priceless, you really can't ask for better printing, it's clear and sharp in fact I plan on doing bussiness with them again in the near future for a custom UMK3 CPO, but as you can see the advertising is for full reproduction artwork, and the end result is far from it. Oooo... nasty. It's not like it's a small bit of text either; it's the huge '3' logo. Shame, but maybe Scott's got someone helping him who forgot to use the proper left artwork. Great news, and I have every faith this was just a simple mistake. That was just the art for the ultra-rare, Mortal Kombat E.
Glad you are getting the biggest issue resolved! I am really embarrased the side art got out the door like that... I finally took everyones advice and hired my first employee and there has been a learning curve. I sent out a new side last week. As far as the CPO sides, we talked and what I sent is correct. Well, I have a minor complaint about Game on Grafix. I don't like the materials used for the CPOs. I just purchased one and when applying it, the graphics developed some cracking over the curved bottom edge of my control panel. I have a dynamo cab and I ordered the CPO to cover it top to bottom. Perhaps the material isn't supposed to be bent in that way (?) but it does have some minor cracking at the bend which I didn't expect. The CPO material is very durable in our experience, even though it does feature a textured shell-like coating. I've found any artwork should be laid flat and kept at a decent warm temerature for a few days before being applied, so maybe yours was cold? This coating is great as it reduces glare on the panel and is a lot harder wearing so we think it's great, but you may want to talk to Scott about this and send a picture or two. Jeeze just jumped through about 30 hoops to get an account just to say how upset I am with this company. I used this company because EVERYONE on here and another araced site RAVED about it. So I placed an order for a Marquee (pre mounted), and a CPO, followed all instructions to the letter. 100% understood the posted work/shipping time. 2 weeks goes by without a word. Finally I get a response back from what I assume is Scott saying he left someone else in charge and that why, blah, blah, blah. I opened my shipment the next day; beautiful artwork - did not get my plexi, the basically just sent my marquee as a sticker. I was sad. Went out and bought plexi to mount myself told them about it and he gave me store credit. - I was happy. I asked some questions and got a very detailed answer about mounting my CPO, do's/donts. I was ready. Finally got my CPO in the mail - once again they got my order wrong. They sent me my Marquee graphic. - I was confounded by their laziness at this point. I said screw it because I had been without a control deck for another week and was tired of the hassle. Followed everything he told me TO THE LETTER. I let him know they sent the wrong graphic - not so much as a response again. It's been about a week since then walked into my game room now both the Marquee and the CPO are bubbling up again. The graphics aren't coming unstuck from the material, when I pulled it off the glue is becoming separated from the graphic because they are printing on cheap material. the graphics LOOK astonishing, super clear, but the material, blown ship dates, and poor attention to something as simple as checking an order before dropping it in the mail is unacceptable. and I'm too embarrassed to even show the thing off to my friends. Thanks for nothing. I appreciate all the rushing around and the half hearted attempt to make up for it, but what was the point? Complete and total fail... waste of money. I think I'll roll the dice with the local sign company on my replacement. Update: Well this is the fastest I have gotten a response from them before, but apparently he's going to send me a refund. I would much rather have graphics on my cabinet though. I took some pictures of the problem for reference as well. AND YES I have tried just peeling it up and smoothing it out and a bit of 3M77 as Scott already suggested, no such luck. And it's not that the trim is aligned wrong either. Well so I kind of feel like an A-Hole, but lets face it, there were issues. Anyway scott contacted me back after seeing these picture. He thinks it's the trim like I thought he might say. I completely disagree because I actually trimmed around the screws before putting that on, and it really doesn't make any kind of pressure on the graphic. Also I have parts of the graphic coming up in the middle away from buttons, and graphic contact. Same with marquee, it's not the pressure. I have a theory though, I think it may have something to do with climate. The machine is in a climate controlled environment, but it may be that he's far up north and I'm far south... so... I don't know. Anyway he's not only given me a full refund, he's re-sending me (again) my full order. Just to be a sport because I see this as him really wanting to do the right thing I'm going to re-apply everything and not put on the trim at all and see what happens. On one hand I'l be mad if I have to eat crow, on the other hand this nightmare will end. Whether it works or not I don't feel I can complain about the situation any more for the simple fact of, what else can he do to make this right? NOTHING. So damned if I complain, damned if I don't. I also feel bad because when I didn't get a response a while back I was pretty snotty and he was still willing to help me after offering me a refund. This is the proper way to deal with a screw up. I just hope he sends me the right graphics... I'd hate for him to be 3 for 3. Based on your pictures it does seem as though the piece of trim is causing the issue. Check that your artwork is actually flush all around as well. Could be the angle of the photo but it look like it isn't on the sides. Dude, you're pretty obviously bunching that artwork up with your trim piece. Those photos are terrible, too. Yes the graphic is flush, I had to re-trim it and it left that white part. The pictures are just crappy. The pictures aren't great mainly because I was taking them with my phone and I couldn't get enough light. Anyway Scott told me that he had changed out one element of his media recently and it could be the issue. We'll see. Anyway, Scott has done his best and I'm happy with the service and the effort to fix. I admit I was frustrated before, but I have tried to remain fair and even apologized to scott for speaking out of frustration. Mainly I was frustrated with the long pauses between responses then the sudden interest after my rudeness. I'm sure he's also plenty frustrated with me as well. Fair enough, best of luck. Nothing like a public shaming to get a vendor to do the right thing. Like I said, he was just slow in response. He's tried twice to help me. It's just on the first shot they didn't bother to care enough to double check what they sent me. After finally getting in touch with him he has been pretty good about answering within 24 hours. I don't blame him for suggesting it was the trim, the pics are crappy (best I could do and didn't think about sending him the follow ups.) I can't ask much more of the guy other than he really needs to get with his newest employee and tell him to pull his head out of his and pay attention to what he sends out. (And I'm obviously not the only one who has had this issue.) It's been give and take both sides. I'm willing to admit it. I may give them another shot, obviously there are plenty of happy customers, can't have a perfect run every time you hit the track. My artwork arrived very quickly and was printed to perfection, exactly how I had provided it down to the Milimeter, I provided 300 DPI files with 1/2" of bleed on all edges. My only criticism was that the vinyl was rolled the wrong way with the printed face on the interior of the roll, this caused a few creases in the side art while still on the mounting paper but I was able to work them out during the application process and they are completely gone now. Sides, vertically dry applied, perfect fit, exceptional color, very high quality vinyl. Marquee, vivid color, doesn't wash out when lit. GOG are not cheap, but the value of the product is without question for me, I'll be using them for all future builds. Got my new graphics (they were all correct) - doing some things different. Hopefully this works out. I trimmed the graphic back even farther than before all the way to the contact point of the trim and the graphic. I sealed the deck with clear coat in case the paint is causing a reaction, I let dry 72hrs. I sprayed the deck with an even layer of 3M77 adhesive before applying graphics. I let dry 48 hours before trimming out the button holes. 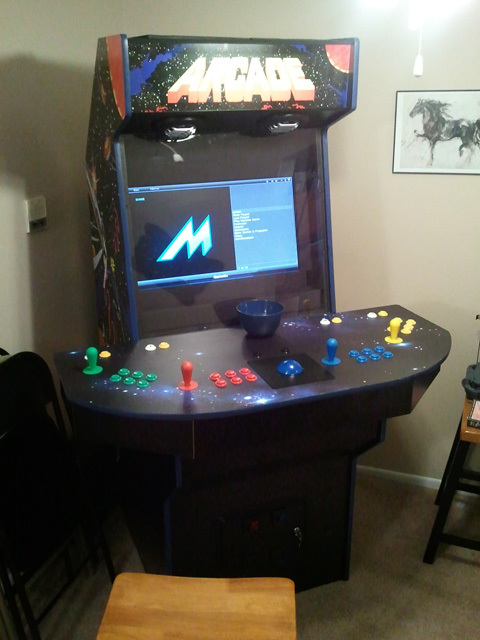 I only put the trim on finger tight, as well as the buttons, and the joystick bolts. Just enough to hold them in place. Everything is on the arcade and looks good. Waiting to see what happens. Will post again in 48 hours with an update. I have a good feeling this time. Oh and the marquee graphic was having issues because of the trim pressure - I loosened the top right screw and the bubble went away. So that one was me, not the graphic. It's been a few days and no problems. Satisfied. I recently ordered a marquee from Gameongrafix after reading these reviews. I ordered a marquee with 2 pieces of plexi and when I received my order it only shipped with 1 piece of plexi. I e-mailed them and Scott apologized and I assumed the next piece of plexi would ship soon. It's been a week and a half and I have not received the other piece. I have since e-mailed him to see if my part has shipped but no response yet. Kinda frustrating as I really liked the quality of the marquee and would like to order side art to match it. Hopefully everything gets set straight and I will report back here soon if it does. Edit: 2nd piece of plexi arrived today. Overall I am very happy so far and will order my side art from Gameongrafix soon. Edit 2: I recieved my side art and couldn't be happier with it. Very good quality. Just received my artwork in from GoG and I'm very pleased with how it turned out. The CP does feel scratch resistant, the colors look deep, and the overall print quality is top notch. Only took about 2 weeks to receive my artwork from the time I placed my order. Would definitely use them again if I started another project or if I decided to add more artwork to this cabinet. you can never leave the game! Second round of art from Scott & Co. @ GameonGrafix for my new cab. Obviously still a WIP. Great as always. They missed the Marquee plexi in the original order, but Scott's response to my "Where's the plexi?" eMail was quick and to the point, with the parts out to me the next day. Considering it's a family business with just 1 employee other then himself, and the holiday rush? Scott's doing a bang-up job.